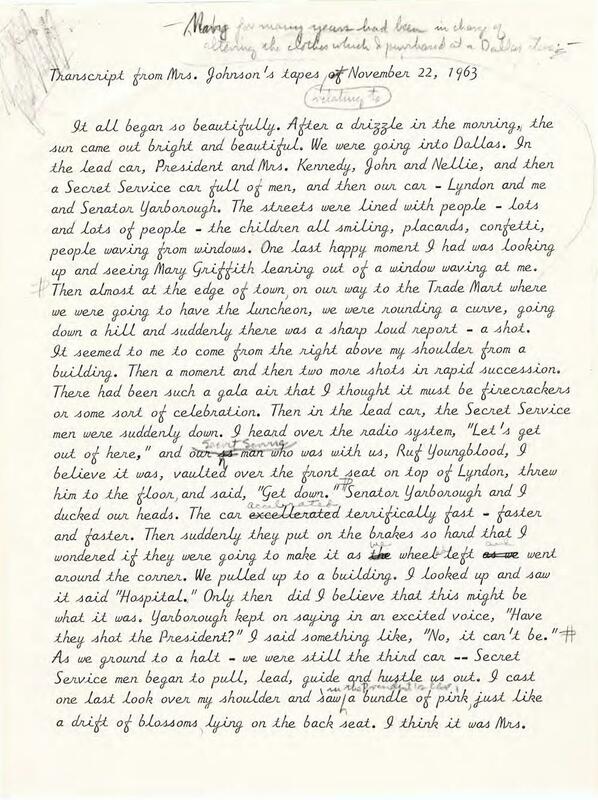 Two or three days after the Kennedy assassination, Lady Bird Johnson made a tape recording of her memories of November 22—primarily, as she told Time in 1964, “as a form of therapy to help me over the shock and horror of the experience.” The new First Lady submitted a transcript of this tape to the Warren Commission, to serve as her testimony about the events of that day. Lady Bird and Abe Fortas, an LBJ advisor and family friend, made the pencilled notations on this draft document. In the Dallas motorcade, Lady Bird rode in the vice-presidential car, separated from the Presidential limousine by four motorcycles and the presidential follow-up car. The Johnsons’ car was a convertible; LBJ, Lady Bird, and Texas Senator Ralph Yarborough sat in the backseat, with Mrs. Johnson in the middle. Texas was the Johnsons’ home state. Many of the dramatis personæ of that day—including Yarborough, Governor John Connally and his wife Nellie, and the judge, Sarah Hughes, who swore LBJ into office—were Johnson friends. I cast one last look over my shoulder and saw, in the President’s car, a bundle of pink just like a drift of blossoms lying on the back seat. I think it was Mrs. Kennedy lying over the President’s body. To read the five-page transcript—hosted on the LBJ Library’s new digital archive covering the transition between the JFK and LBJ administrations—click here, or on the image below. Edited Transcript of Lady Bird Johnson’s Audio Diary, 11/22/1963.